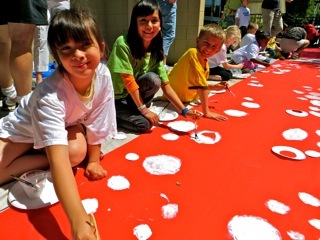 Second-grade students in Ms. Cressey’s and Ms. Warren’s classes had plenty to smile about last week when they put the finishing touches on a large-scale outdoor project, which was the brainchild of class parent and artist Dana Shields. The spectacular project transformed a grove of on-campus trees into a vibrant, polka dot–covered work of art in the style of contemporary artist Yayoi Kusama, the Polka Dot Princess. Forty yards of painted fabric adorn the tree trunks and scores of painted lanterns hang from branches, the diligent handiwork of the students. Kids and teachers weren’t the only ones to get in on the act. Parents, grandparents, and caregivers also helped with painting, tree-wrapping, and lantern-hanging.